The object is a blazar, in fact an FSRQ (Flat Spectrum Radio Quasar) quasar, the most energetic subclass of objects known as active galactic nuclei, produced by the rapid accretion of matter by a central supermassive black hole, changing the gravitational energy to light energy that can be visible in cosmic distances. In the case of S5 0014+81 it is one of the most luminous quasars known, with a total luminosity of over 1041 watts, equal to an absolute bolometric magnitude of -31.5.
oNormal" style="font-family: Merriweather, Georgia, serif; font-size: 16px;"> If the quasar were at a distance of 280 light-years from Earth, it would give as much energy per square meter as the Sun despite being 18 million times more distant. The quasar's luminosity is therefore about 3 x 1014 (300 trillion) times the Sun, or over 25,000 times as luminous as all the 100 to 400 billion stars of the Milky Way Galaxy combined, making it one of the most powerful objects in the universe. However, because of its huge distance of 12.1 billion light-years it can only be studied by spectroscopy. The central black hole of the quasar devours an extremely huge amount of matter, equivalent to 4,000 solar masses of material every year. The quasar's designation, S5, is from the Fifth Survey of Strong Radio Sources, 0014+81 was its coordinates in epoch B1950.0. It also has the other designation 6C B0014+8120 from the Sixth Cambridge Survey of radio sources by Cambridge University. The host galaxy S5 0014+81 is an FSRQ blazar, a giant elliptical galaxy that hosts a supermassive black hole in its center, which may be responsible for the intense activity of this blazar. In 2009, a team of astronomers using the Swift Spacecraft used the luminosity output of S5 0014+81 to measure the mass of the central black hole. To their surprise, they found out that the central black hole of S5 0014+81 is actually 10,000 times more massive than the black hole at the center of our galaxy, or equivalent to 40 billion solar masses. 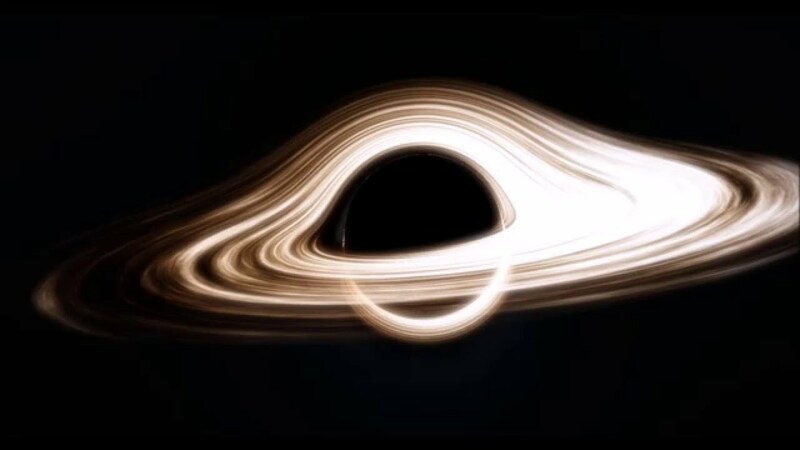 This makes it one of the most massive black holes ever discovered, more than six times the value of the black hole of Messier 87, which was thought to be the largest black hole for almost 60 years, and was coined to be an "ultramassive" black hole. The Schwarzschild radius of this black hole is 118.35 billion kilometers. 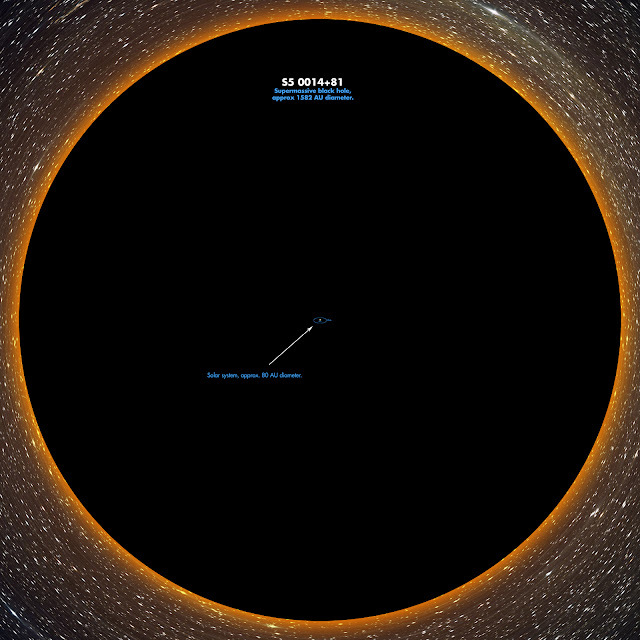 So, this black hole has an external horizon showing a diameter of 236.7 billion kilometers, 1,600 astronomical units, or 37.4 times the diameter of Pluto's orbit, and shows a mass equivalent to four Large Magellanic Clouds. What is even more astounding is that the monstrous black hole exists so early in the universe, at only 1.6 billion years after the Big Bang. This suggests that supermassive black holes grow up very quickly. However, there are some cautions about the study. First, the method used was actually an indirect method of calculation, and not Keplerian orbital estimation; the latter being a more precise estimate. It is unlikely for a quasar as luminous as S5 0014+81, which will just outshine the stars within its vicinity, thereby making estimates very inaccurate. Second, the spectra used is actually a long spectra, not accounting for the observed parameters. Third, the quasar is surrounded by a large accretion disc, a few parsecs in size, and it shines at 40% of its Eddington luminosity, the maximum luminosity through which radiation pressure is strong enough to blow up the disc away from the gravitational influence of the central black hole, so the observed characteristics are unknown due to intervening dust and gases. However, the possibility of an ultramassive black hole has not been ruled out entirely, since only a black hole of that mass can account for the observed power output of the quasar. Evolution models based on the mass of S5 0014+81's supermassive black hole predict that it will live for roughly 1.342×1099 years (near the end of the Black Hole Era of the Universe, when it is more than 1088 times its current age), before it dissipates by the Hawking radiation. However, it is undergoing accretion, so it may take longer than the stated time for it to dissipate.